in response to the 8 October, 2005 Earthquake. 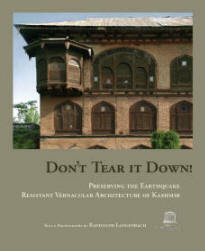 Click "Enter" to find information about Kashmir and the book. In the quest for a sustainable world, where local cultures are respected and celebrated, this website is dedicated to the rediscovery and revival of traditional building technologies that have proven themselves over centuries of experience with earthquakes and other natural hazards. Traditional IS Modern in those many parts of the globe where pre-modern vernacular buildings of unfired earth, timber, and masonry have remained standing while modern buildings of reinforced concrete and steel have fallen.